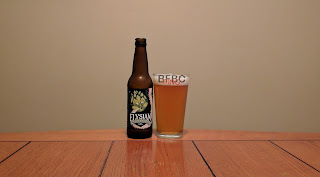 The first beer I had from these guys was a bit... full of character, but it was certainly an enjoyable experience. 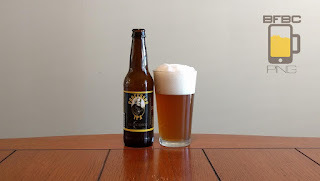 A white ale is a good style for them to try, as it is difficult to get right, but it rewards patience and skill for a brewer who is willing to brew in the tradition of the style. The pale gold beer has a little white head when first poured, but it goes away pretty quickly. There are still a few bubbles left, but not many at all. The aroma is exceedingly light, but I think I smell citrus and ... soap? Honestly, that might be coming from my hand, as the aroma of the beer isn't all that significant. Out to watch a Steelers game at a local bar, I decided to ask for a good sized sample of the most expensive, most alcohol-rick beer they have. It's called New Holland Dragons Milk, and it is pretty self-evidently a stout. Unfortunately, I can't get any specifics about this beer (which I got on tap) from the waitress. 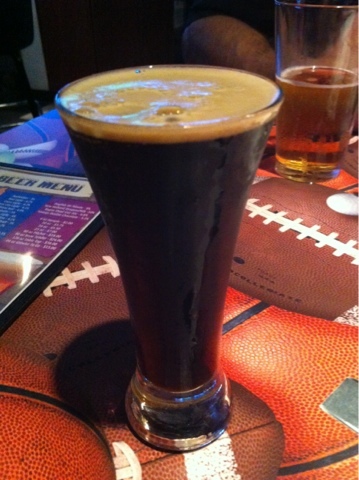 A quick look on my iPhone shows that it is a bourbon barrel stout, and that generally doesn't help me out. I'm not a fan of mixing my strong drink with my frothy beverages. The head is very much that of a stout. A light, spotty head with tiny bubbles cuddling around the rim. The color is a dark brown to the point of being impenetrable. The aroma is mostly smokey oat. There may be a hint of the aforementioned bourbon in there, but I can't smell it too well; it's possible the smell of the free popcorn is overwhelming it. 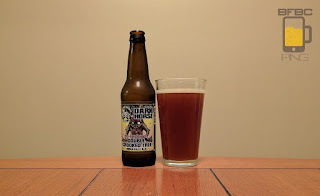 I have already reviewed this beer, but that was kind of in the infancy of this blog, and I like to think I learned a lot since then. 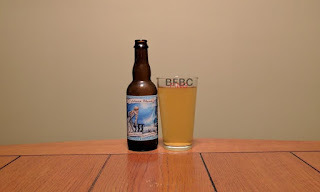 More importantly, I really liked this beer, and I have such good memories of it that I thought it deserved an updated review. The golden beer is not murky at all, unlike my past experience with the beer, and that makes me look twice. The head is voluminous, which is also very unlike the previous version of this beer that I had. I'm a little apprehensive as a result of these changes, but I'm going to assume that Victory made changes based on improvements they thought they could make to the beer, and I'm not going to second guess them. 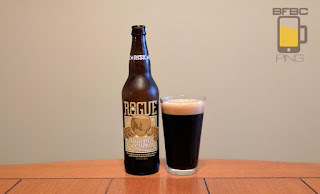 The aroma is sweet malt and spices, and I have stopped caring how this compares to the original - I want to drink. I've only had two other Elysian beers. On the whole, they were goddamn spectacular. Now, I get an IPA - which is in the center of my wheelhouse. I am told that they are the easiest to make, the hardest to get wrong, and I love a good IPA to death, so these guys are going to hit it out of the park. The slightly hazy, flat copper colored beer has a remarkably sticky head that leaves lacing like it is putting up wallpaper. The aroma is WAY lighter than I would have expected. I think there is a pine or citrus hops, but I'll be damned if I can separate the two. It is really, really light is what I'm saying. If a normal IPA is a Charger Hellcat screaming away at a light, this is more like a Nissan Leaf. I like the fact that Cranker's didn't try to give this beer too many names. A lot of the beers I've had lately have absolutely massive names that I either have to abbreviate something in or just ignore things like "Signature Series" or "Artisanal Ales." These guys cut to the chase, and they just put out some damn beer. Cheers, guys! Hazy as a Beijing morning, this sucker has a full head. The picture here was actually after I let it go down and poured more beer in. I didn't have the patience to wait and then add the rest of the beer, but I assure you that all the beer is not in the glass at this time - all because of the fullsome head. The aroma is a very musty floral and pine hops. It's got a layer of dust on it, but that doesn't mean it will be bad. So, I was told to try this. 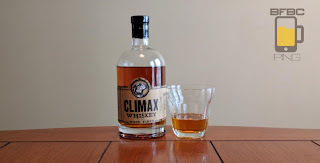 Someone I know watched a TV show that had this distillery in it, and they showed the business issues and decisions that resulted in this whiskey. Specifically, I was told that this is simply moonshine where they added wood chips, sent some alternating current through it for a while, and wound up with amazingly good whiskey. The bottle however, claims that this is an old family recipe. I don't care which story is true. I have seen very few whiskeys before, and I usually notice that the amber liquids have a kind of swirling series of eddies where a series of nearly microscopic wood fibers and... stuff ...is disturbed by being outside of the barrel now, and it is stretching its legs. This doesn't have that. Instead, it's a flat amber with an aroma like whiskey. Maybe it has wood, but not oak - more like maple or even pine (wood, not needles). 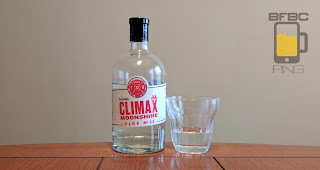 When I picked up a whiskey from Climax, I figured I would also try out the moonshine that benefits a local North Carolina fire department with every purchase. After all, I like to help out the rescue workers who help support the public, and I also know that adding flavors to moonshine is the way to make it drinkable. This is where I would normally describe the look of the beverage. Imagine water, vodka, flat 7-Up, or any number of other clear liquids and you know exactly what this looks like. The aroma is slight cinnamon sugar added to Aqua Net. I swear, I have totally like some moonshines in the past, and I'm not expecting this to be lousy, but the aroma is displeasing. Dear Rogue, please do not include any kind of pun in your beer names from now on. You're pretty clearly not good at them, and your talents at making beer should be enough to sell it. When you start to pun, it makes me nervous that the brewer had been distracted and may wind up with a bad beer with a cutesy name. This beer is not black. It may look that way in the photo, but it's actually semi-light-permeable. It shows the deep, deep blood red color when you shine a light through it, and the light tan head atop it allows the highly sweet, chocolaty aroma to spread out pretty well. The nuts back it up, and the beer is consequently pretty enticing. With Dark Horse, the results seem to have been a bit up and down. The most interesting one from this point is to consider the Crooked Tree IPA. That beer was okay, but I scored it just below average. Maybe what the beer needed was to be made into a double IPA, which, unlike what the name would seem to indicate, typically seems to be maltier than the average IPA, and that is exactly what Crooked Tree IPA needed. This sucker is brown. Imagine what a brown ale should look like, and you have this beer. In fact, I'm pretty sure there have been some brown ales that could not achieve this level of brownness. The little head becomes a mere smear across the top while the aroma exudes a pine smell that makes me think of a dark, wet woods with about half an inch of snow on the ground that is slowly melting. That's right - an aroma makes me all poetic and stuff!